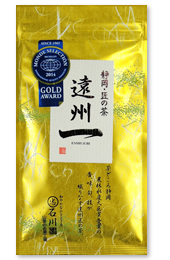 Enshuichi is made from strictly selected green teas, with a distinguished taste and "in-season, aroma", produced by excellent tea plantations recognized as the best green tea producers in Japan at the national tea exhibition fair held at one of Japan's major centers of tea production, the Enshu region of Shizuoka. They have also received an award from the Japanese Minister of Agriculture, Forestry and Fisheries. We blend, heat, and process the tea leaves ourselves using our own techniques to make "a tea artisan's best tea". You can enjoy the sweetness and mild bitterness of Gyokuro. We finish this tea by deep-steaming Gyokuro tea leaves which were cultivated gently and carefully covered with a straw-mat, blending them with hard-heated Sencha, and powdering them with high quality Matcha. This tea is suitable for summer, having the sweetness and mild bitterness of Gyokuro. You can brew with cold water so the tea leaves a refreshing feeling both on one's tongue and when passing down one's throat. You can make the same delicious green tea with this tetra tea bag as that brewed with boiled water. In order to bring out its delicious taste and beautiful color even with cold water, we heat the tea leaves strongly with far-infrared rays and blend in Matcha powder. The Shizuoka Sencha and Kyoto Matcha are blended, then mixed with Yuzu produced in Umaji-mura in Kochi. The cool sensation and comfortable flavor are very refreshing. 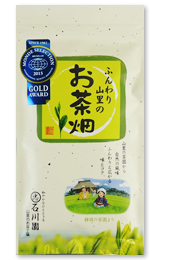 Please enjoy our yuzu-citrus flavored Sencha-blended tea bags for cold-brew. We bring out these three tastes. Please enjoy the mild sweetness of Matcha while relaxing at home. Drink and eat to get all the nutrients of tea leaves. You can use powdered tea for cooking and making sweets. Sugar-free & non-calorie, but sweet! Three new flavors: standard, lemon and ginger. Good for teatime in winter.